Today, on May 31, 2006 an extraordinary event happened, that will please very much all the Centipede friends, children and fans. 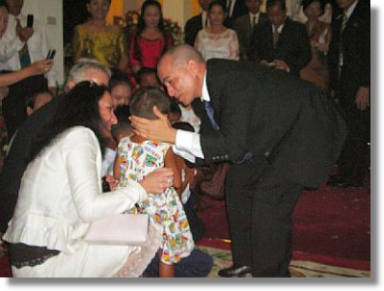 His Majesty Norodom Sihamoni, King of Cambodia, decided to visit personally the children in the House of Family in Phnom Penh. His Majesty met couple of children already in March at the event in the Chaktomouk theatre. Meeting the children obviously impressed His Majesty a lot, so He decided to meet the children again. How surprised all the inhabitants from the House of Family were when they learnt on Monday that His Majesty will come for a private visit!! The whole two days preparations were going on and the atmosphere of the joyful expectations was marvellous. Today, from five o’clock in the morning the preparations were culminating. The children were waiting for His Majesty for almost two housr… And He came. Smiling, as usually, very nice and considerate, with His heart in His hands. He greeted himself with everybody, every single child, and listened carefully with emotions to the stories about the lives of the children, their destinies and hopefully brighter future. The Slovak colleagues showed Him round the House and showed every corner. For the children meeting the King was the best experience in their life. They sang their frolic songs and handed over their presents – a beautiful colourful T-shirt and pictures. His Majesty appreciated very much help that House of Family gives to the children and expressed His full support to the project. He also handed over a financial gift to the House. It was not only a courtesy call. The King wanted to see the children himself and the visit was even with all the strong rules of the Royal Protocol realised. His Majesty brought to all the children personal gifts, handed them over personally and wished good luck to everybody. His interest was real and the enthusiasm for the children „human“. We are experiencing another unforgettable event that will stay in our hearts and we have another impulse for our wonderful work. The children in Cambodia will remember this morning forever. And – who knows – maybe thanks to the medical help, in many years they will still tell stories about their morning with the King.